This August, WizKids will inaugurate a new line of premium pre-painted figures as D&D Icons of the Realms Premium Figures. Like other models in the D&D Icons of the Realms line, these figures will be fully painted plastic miniatures featuring characters from the Dungeons & Dragons world. Some of the figures will also feature translucent elements. The Premium Figures will be presented in clear plastic packaging so the buyer can see the miniature before purchasing. All six figures will be sold separately, one figure per package. MSRP is $7.99 each. 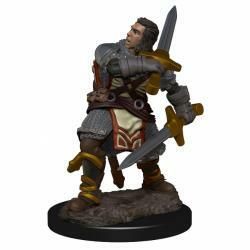 Some of the models were previously released in unpainted format as part of the D&D Nolzur’s Marvelous Miniatures line.